~Reduce speed to low and add flour mixture in three batches and buttermilk in 2, mixing well after each. ~Divide batter evenly among baking cups, I use a 1/4 cup to measure out my batter, and to insure the cups are of equal amounts. ~Bake for 15 minutes, rotate pan 180 and bake for another 8 minutes, until tester (toothpick) comes out clean. 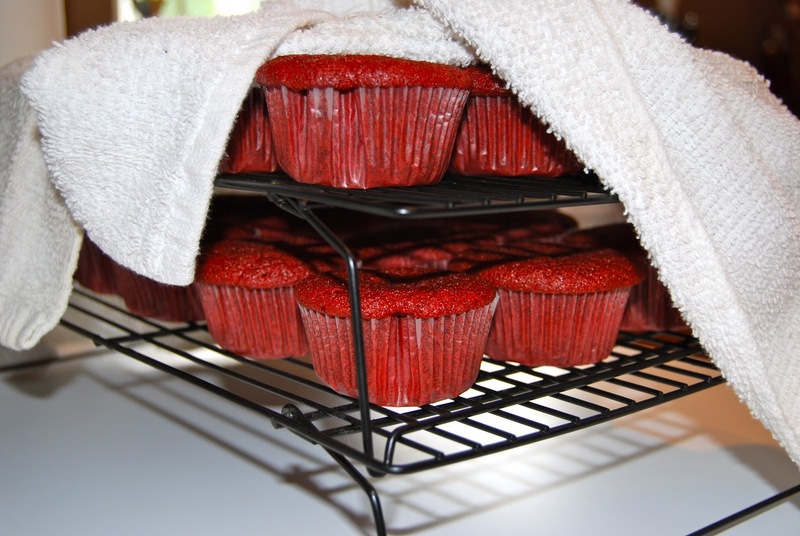 ~Let stand in pan for 10 minutes then take them out to cool at room temperature. 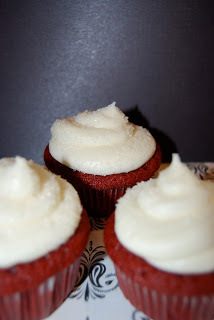 ~In an electric mixer on medium speed cream the butter and cream cheese together until fluffy, 3-5 minutes. ~Reduce speed to low and add in sugar 1/2-3/4 cup at a time. Mix well after each addition. ~Add Vanilla extract, scrap down the sides of bowl and mix for 2-4 minutes more. I usually make my frosting first and let it set up in the fridge before I make my cupcake batter. 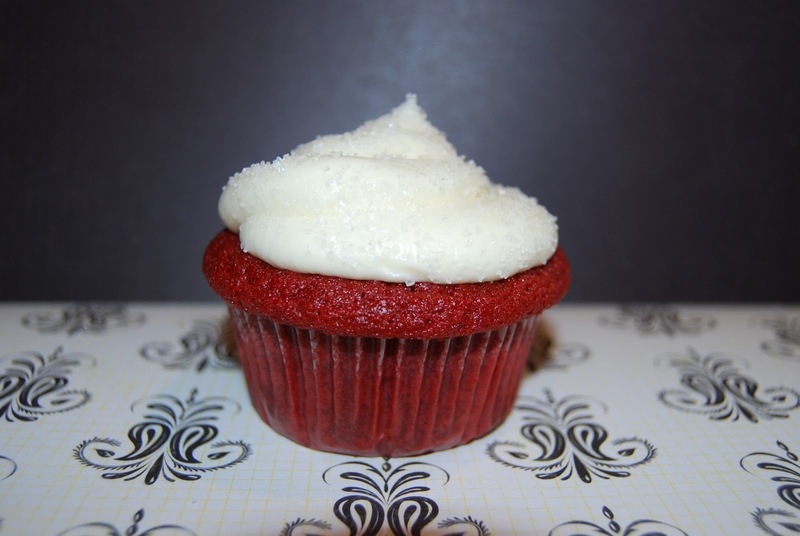 If you do this, make sure you mix up you’re frosting before pipping onto the cupcakes. The they were then frosted and covered in White Sanding Sugar to give them a bit of sparkle. *I use AmeriColor gel food coloring, their great, and come in a TON of colors, I had about 4 different red’s to choose from at the store, you can get them on Amazon too…I used Super Red , and loved the way they turned out color wise with using these. Categories: All-Amerian, Baking, Cake, Cheese, Chocolate, Cupcakes, Sweets | Tags: All-American, AmeriColor, baking, cake, Cheese, chocolate, cream cheese, cupcakes, Red Velvet, sanding sugar, sweets | Permalink.